455 Central Park West "The Castle"
In Sunday’s New York Times real estate column Big Deal by Josh Barbanel there’s an item titled Five Turrets, No Dungeons about a couple that recently bought and moved into their new $6.4 million turret condo at 455 Central Park West between 105th and 106th Street. Jonathan Miller from Miller Samuel appraisers said the prices paid for the turret apartments were the highest prices paid for a coop or condo north of 96th Street. Of 19 condos there are 8 still available priced from $4.8 - $7.6 million. I have also heard that the Ariel the two new luxury glass towers going up on opposite sides of Broadway at 99th Street has a contract on a $7 million penthouse apartment. Affluent buyers paying record prices are moving on up to deluxe apartments on the Upper Upper West Side. The apartment is over 5000 square feet with 3 bedrooms, 4 bathrooms, a library, dining room, and family room; eat in kitchen, two terraces and a patio with 1000 square feet of outdoor space. The French renaissance style chateau building has intricate wrought iron gates, arcaded loggia and imposing circular towers and slate roof. 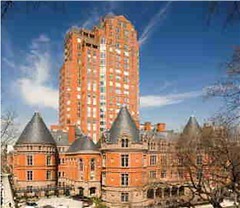 Built in 1887 for the New York Cancer Hospital, the first cancer hospital in the city. The building has 5 round turrets because at the time it was built corners were thought to harbor germs. It later became a nursing home and asylum whose management was convicted of Medicaid fraud and it closed. The building had been dormant and decaying for more than 25 years. Local neighborhood residents call it the castle. In 2001 a Chicago developer Dan McLean who also built a development on Fisher Island off the Miami coast broke ground blending the landmark building with a new 26-story tower. The new building shares a lobby and courtyard with the chateau-style structure. Each turret condo has at least 1 circular room. 9/11 caused hardship and a halt to the project until Columbia University came to the rescue. The first 15 floors in the tower were bought by Columbia University. They bought 2 and 3 bedroom apartments for prominent professors and visiting dignitaries. They paid $45.38 million for 53 luxury condos an average of about $1 million per apartment. Columbia a large owner of Manhattan real estate on the Upper West Side, Harlem, Morningside Heights and Upper Manhattan also bid on the property but lost by $200,000 to MCL companies. Columbia has also recently put up Luxury Residential Towers on Broadway at 103rd and 110th streets and has major expansion plans including a new campus in the Hamilton Heights section of Harlem. I attended a broker party a couple of years ago when they started selling. The remaining 44 apartments started at around $1.35 million. The building features include many amenities including valet parking, a concierge a health club and pool. its hard to believe all the wealth you have in one city. Intersting blog on your area. Do you have a website that features such things? I didn't mention it in the blog but there is a housing project located next to the new luxury condo. The wealthy and the poor live next to each other. Unfortunately the middle class can no longer afford Manhattan. i will take a look. There should be someway to keep a middle class in town. I was in Manhattan in April with a tour group from my son's school band. We came by "The Castle". I loved the color and the structure of it. When I got back home I tried to remember what the name of the castle was and could not find it. I googled everything about castles in Manhattan but nothing showed up. I was going back through my pics again and saw a bus in front of the castle, I could read the street name on it and googled it and boom there it was. Our tour of Manhattan was everything I could imagine it would be. I have always wanted to come see NYC but never got the chance to come until April. The city was awesome and the people were very friendly toward us.